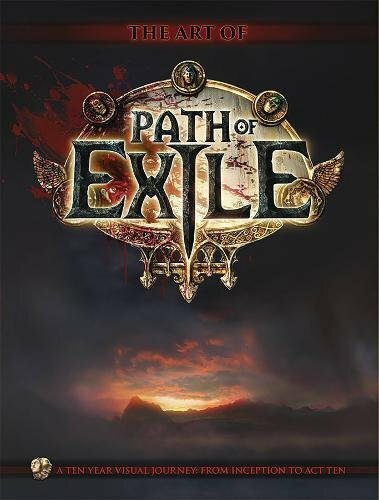 Here's the concept artbook for Path of Exile, the action RPG that was made by Grinding Gear Games and published in 2013. This book is a 152-page hardcover. The book features concept art from the beginning, in 2006, when Erik Olofsson was only artist, Over the years, the team grew and so did the amount of art. The concept art are mostly character designs and environments. The early pieces of artworks do feel unfinished. They look fine though and there are plenty of cool character designs. It's just that there's this lack of details. Thankfully the quality improves progressively later in the book. The overall ghoulish dark fantasy vibe is done well. It has its fair share of grotesque and mysterious characters. The environment artworks are nice. I like the scene paintings. There are also sketches, in-game design environment and interiors. The only text included are some interviews with the artists, and short introduction to the different Acts. It's a decent companion for the game. Fans might want to check it out. Started playing this game again and was vaguely irritated with the way the art plays out on my computer. Checked out the official wiki, barely any concept art. So I checked your site to see if there was an art book and voila. There was and it was available digitally (instant gratification woooooooo). Bam, I’ve spent the day reading and scribbling out sketches. I got it via your link so hopefully the commission thing works. Amazon has about no supporting material, so without your review I wouldn’t have bought it.